Despite the size of your iPhone 7 Plus' battery, you may find it's not lasting through the day, especially if you're a power user. Carrying around an external battery pack can be cumbersome, so why not streamline the process and grab a battery case instead. It'll probably bulk things up a bit, but better bulky than a brick. This case has a whopping 8000mAh battery, which more than doubles your battery life. Four LED indicator lights keep you apprised of its charge level. Smtqa's case also has a handy kickstand for when you're watching videos with all that extra battery life. Mophie's Juice Pack comes in five colors and has a 2420mAh battery, which should give you an extra half-day's worth of charge. This one's ideal if you're a power user but don't mind charging up nightly. It has LED indicators on the back and proper cutouts for speakers and your camera. This one's bulky, but it does provide solid protection, albeit expensively. This 7200mAh battery can double the battery life of your iPhone 7 Plus. The LED power meter shines in four different colors, to indicate the percentage charge you have left. The raised bezel around the iPhone screen means this is a fully protective iPhone case as well as a powerful battery. 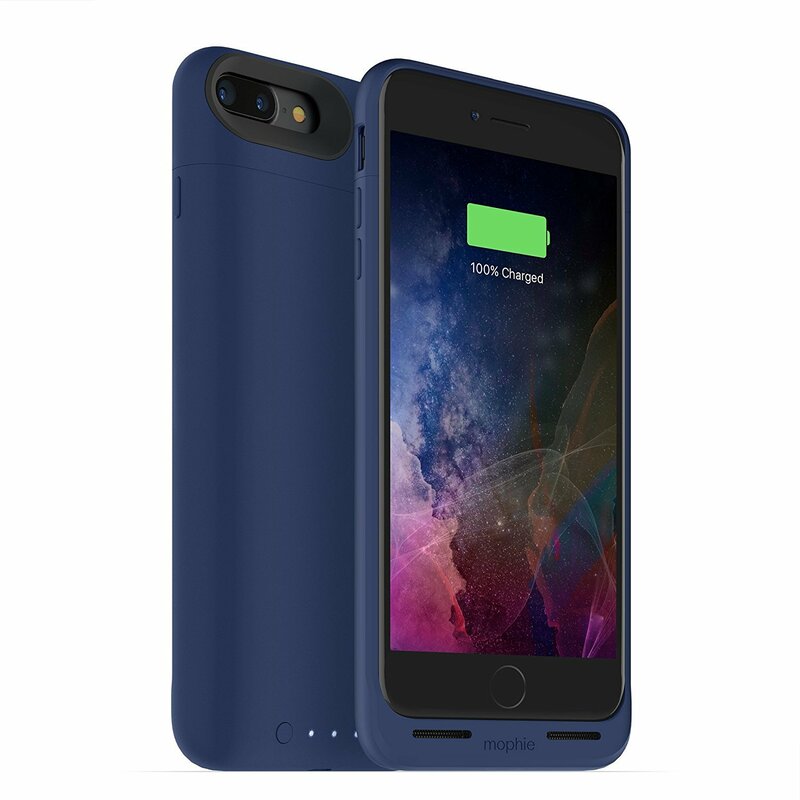 If you want to go beyond the basic colorways, check out this powerful 7000mAh battery case. This is a lot of juice for the buck. In addition to offering nice conservative Black and Gold shades, they also offer the slightly wild electric Purple shade seen here as well as an acidic lime Green. If you want this gorgeous metallic red, this is the case for you. While it only has a 4200mAh battery, not as much as some of the others on this list, it has the added bonus of being compatible with a magnetic car mount. Plus it has an excellent price point. All of these battery cases will be compatible with both the iPhone 7 Plus and the iPhone 8 Plus. For my money, the Smtqa battery case is the best option, since it has the most battery power. It should keep your iPhone going at least all day and into the next, and it's protective without being extremely bulky. If you're wary of buying an unknown brand, the Mophie Juice Pack can be found on the shelf of your local Apple retail store, so it's a brand you can trust. And if you just want a fun color, a lot of battery power, and don't want to spend a lot, I'd go for the Taeozi battery case. If a slim form factor is your highest priority, go for the Swaller battery case. I’m a travel enthusiast, teacher, writer, and an early adopter who has stood in more release-day lines than I can count. I’m a former Apple retail store Specialist and I’ve been writing Apple-focused product reviews for over seven years. You can find me on Twitter as @KarenSFreeman and Instagram as @Karefree2.